The fallout from an Air Force cheating scandal continues to spread, and now a significant portion of the leadership at a Montana nuclear base is getting sacked. Nine officers in leadership positions were recommended for removal and are being reassigned, with Air Force Col. Robert Stanley, who oversees the missile crew, resigning, Air Force Secretary Deborah Lee James said Thursday. The officials weren't involved in the reported cheating, but James says "they failed to provide adequate oversight of their crew force." And though Lt. Gen. Stephen Wilson, commander of Air Force Global Strike Force, couldn't give the specific number of leadership positions at the Montana base, he said the removals represent a "significant portion" of the chain of command. The duo announced in late January that 92 missilers—almost half—at the base were being investigated for alleged cheating on a monthly proficiency test, or for knowing about the cheating. James said Thursday that that number had grown to 100 missileers. So far nine have been cleared by investigators. The alleged cheating also went on significantly longer than the two-month period officials originally reported, with the investigation suggesting that cheating could have started as early as November 2011 and could have continued until November 2013. But officials remain confident after conducting an investigation across the country's three nuclear missile bases that the cheating is only tied to the Montana base. The Air Force's investigation pointed to four crew members "at the center" of the cheating scandal in which test answers were reportedly shared via cellphone. Three of those four are also tied to an investigation into illegal drug use. 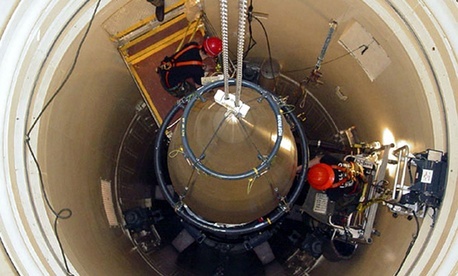 James and Wilson stressed that they remain confident in the nuclear-missile crew, but they are instituting a series of reforms in the wake of the far-reaching scandal including revamping testing procedures; looking at ways to redirect funding to improve readiness and quality of life for the nuclear missile crew; and reforming the crew force's culture. "If one person had spoken up this could have been very different, and so that's why we're really focusing on what integrity means," James said.